But what about the fact there's no evidence of currents flowing into the Sun (anode)? I agree with Bob Johnson's "current free double layer" Sun. Hello. The red arrows of rotation we see as a problem. When we look back at the Electro earlier post, the picture shows a 2 way motion. To have a 2 way motion, we must have 2 different pressure conditions. It will not be created with the same windings. For this reason, the windings must be different to create an opposite effect. Following arrows which are clockwise, meaning, 2 north or south poles outside and we know it cannot be so. Aligning arrows in the same direction results in winding and unwinding, pressure or vacuum, generation and radiation. Every mass is a vacuum tube which separates motion from every other motion. When power comes from the outside, as stated, it will create 2 different actions in each hemisphere. The equator can be visualized like a large Swiss watch spring that unwinds radiation into cold space. If the big coils on the poles were conical, it would be closer to nature's workings which never uses anything in cylindrical shape. In this picture, for the first time, the star is shown as a space between magnets rather then being one. If one would like to create nature's coil, it would have to wind it in the same direction, starting from the middle towards the poles. Connecting the centre wires to the positive and outside wires to negative, we would create nature's beauty, simplicity and power. This explanation is intended mostly for those who are searching to create something of their own. We thank you for inquiring and should you need further discussion on this topic, I would be more then happy to assist. For the power coming in, it would be just my opinion, rather then my knowledge and I would not like to offend anyone with stating what may be true for me in this post. Are you referring to something like the "Primer Fields"? Electro wrote: Are you referring to something like the "Primer Fields"? If he/she is, I would tend to agree, however the natural source of that shape/form of magnetic field that would create it is hard to conceive of. Primer field would be a good example. Electro's post July 2nd is showing a 2 way flow. Without 2 opposite conditions or polarities, motion cannot be created. In the picture of the sun the arrows are showing only one polarity. Electricity creates 2 opposite pressure conditions where motion is not only possible but imperative. Not being precise with their diagrams creates more problems rather then solutions. 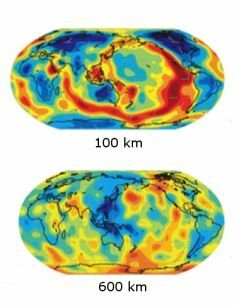 Mysterious blobs of distinct rock are imaged using waves from earthquakes (model from French and Romanowicz, 2015, Nature). Two continent-size blobs of hot — and possibly molten — rock can be found deep underground, about halfway to the center of the Earth, according to a new study. These curious structures — each of which is so large that it would be 100 times taller than Mount Everest — could be made up of materials that may shed light on how the Earth formed, the researchers said. One of the blobs is located beneath the Pacific Ocean, and the other can be found beneath the Atlantic. These underground structures start where the Earth's mantle meets the core, but they send "plumes" up through the rock like a Lava Lamp, the researchers said. "To me, the big unanswered question is, what is it, and how did it form?" said the paper's lead author Edward Garnero, a professor in the School of Earth and Space Exploration at Arizona State University. Scientists have observed the blobs for decades by monitoring seismic activity in the two regions. Different types of seismic waves travel at different speeds, depending on the type of rock the blobs are moving through. And by comparing the timing and delay of signals from multiple locations, seismologists can build models of what's going on in the Earth's interior. 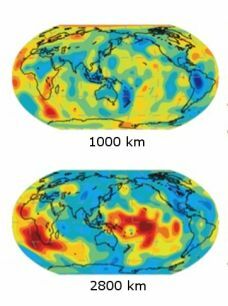 The blobs are characterized by slower wave speeds, which suggests they are a different temperature from the rest of the Earth's mantle, the researchers said. But at some of the edges, normal wave speeds transition abruptly to low wave speeds. A pure temperature difference would result in a more gradual change, the scientists said, which suggests the blobs are likely made up of something different from what makes up their surroundings. Because they're big and characterized by the slower wave speeds, the blobs have been called large low velocity provinces (LLVPs). And when the speed of one type of wave, shear waves, is even slower than would be expected, scientists call the areas large low shear velocity provinces (LLSVPs). But beyond that, not much is known about the origin or composition of these strange rocky blobs. "The LLSVPs are definitely there, but the terrible name they have been given reflects the fact that we don't really know what they are," Richard Carlson, a geochemist at the Carnegie Institution for Science in Washington, D.C., who wasn't involved with the new paper, wrote in an email to Live Science. The Lava Lamp comparison is appropriate — except when this Lava Lamp blob reaches the top, it spills or explodes out of the Earth's surface, Garnero said. If an especially large "superplume" of magma from one of these blobs were to make it to the surface, it would result in "massive eruptions where the lava will come out for millions of years at a time," Garnero said. There isn't much cause for alarm, though. "The next one could be on its way," he said, "but it could be a million years away." Scientists aren't sure if the blobs are made of material from the Earth's crust or if the chemical difference dates back to the Earth's formation. "If we understood these 'blobs' better, that would represent a huge step forward in understanding the deep workings of our planet," Wendy Mao, a geoscientist at Stanford University who was not involved with the new paper, wrote in an email to Live Science. The new research was published online June 20 in the journal Nature Geoscience. It may be just a trick of the light, so to speak , but from this perspective it sure looks like something popped. The current view is that the lobed shape of the comet is a product of 'binary contact', but this view of the comet seems more indicative of separation than evidence of a contact event. Licensed under a Creative Commons Attribution-ShareAlike 3.0 IGO License. Oh, wonderful. There go my vacation plans. HA! Enough time to build a space ark? Scientists in the US have discovered that rare volcanic eruptions – so catastrophically powerful that they could potentially devastate the entire planet – might only give up to a year's warning before they unleash fiery hell. Super-eruptions, which can eject thousands of cubic kilometres of magma to the planet's surface, build up over a massive time frame – but volcanic samples suggest the final stage of decompression before magma release happens much more quickly. "The evolution of a giant, super-eruption-feeding magma body is characterised by events taking place at a variety of time scales," says geochemist Guilherme Gualda from Vanderbilt University. "Now we have shown that the onset of the process of decompression, which releases the gas bubbles that power the eruption, starts less than a year before eruption." To investigate the duration of the final stage before a super-eruption, Gualda and fellow researcher Stephen Sutton from the University of Chicago examined quartz crystal deposits from Bishop Tuff – a rocky outcrop that formed from the super-eruption that created the Long Valley Caldera in central California some 760,000 years ago. Scientists previously thought that this quartz crystal – which covers the surface rims at super-eruption sites – formed over the course of several decades in the period immediately prior to an eruption, but the new research indicates the time scale could be much shorter. Using a new method to measure rim growth times based on the concentration of titanium in the crystal, the scientists think that the eleventh hour before a super-eruption can occur very quickly, capping a volcanic buildup that might have slowly developed over tens of thousands of years. "Maximum rim growth times span from approximately 1 minute to 35 years, with a median of approximately 4 days," the researchers write in PLOS ONE. "More than 70 percent of rim growth times are less than 1 year, showing that quartz rims have mostly grown in the days to months prior to eruption." According to the researchers, this rim growth heralds the onset of a transition from "pre-eruptive to syn-eruptive conditions", during which volcanic magma would begin to decompress and expand underground – a geological phenomenon that the researchers suggest would likely have noticeable effects on the Earth's surface in the final months before a cataclysmic super-eruption. Why would a super-eruption be so dangerous? Not necessarily because of the ejection of magma and massive geological movements on a local scale – meaning you really wouldn't want to be close-by for this one – but because of the huge dispersal of ash clouds in the atmosphere, which could block out the light and heat of Sun, potentially for years or even decades. The 1815 Eruption of Mount Tambora is the largest super-eruption in recent (recorded) history, and the subsequent ash cloud lowered temperatures around the globe – creating in 1816 what became known as the "Year Without a Summer", the "Poverty Year", the "Summer that Never Was", and any number of other dramatic nicknames. The good news is that the researchers think that Earth's supervolcanos that could give rise to subsequent super-eruptions in the future – like Yellowstone Caldera in the US and Lake Toba in Indonesia – won't do so any time soon – although we're finding out more all the time about the state of these sites. In any case, it's likely that the world hasn't seen its last year without a summer – but hopefully it won't be something that happens in the near future. "As far as we can determine, none of these places currently house the type of melt-rich, giant magma body needed to produce a super-eruption," said Gualda. "However, they are places where super-eruptions have happened in the past so are more likely to happen in the future." Australia is to shift its longitude and latitude to address a gap between local co-ordinates and those from global navigation satellite systems (GNSS). Local co-ordinates, used to produce maps and measurements, and global ones differ by more than 1m. The body responsible for the change said it would help the development of self-driving cars, which need accurate location data to navigate. Australia moves about 7cm north annually because of tectonic movements. Modern satellite systems provide location data based on global lines of longitude and latitude, which do not move even if the continents on Earth shift. However, many countries produce maps and measurements with the lines of longitude and latitude fixed to their local continent. Infographic: Co-ordinates in Australia are out by about 1.5 metres because the country is moving 7 centimetres north every year. "If the lines are fixed, you can put a mark in the ground, measure its co-ordinate, and it will be the same co-ordinate in 20 years," explained Dan Jaksa of Geoscience Australia. "It's the classical way of doing it." Because of the movement of the Earth's tectonic plates, these local co-ordinates drift apart from the Earth's global co-ordinates over time. "If you want to start using driverless cars, accurate map information is fundamental," said Mr Jaksa. "We have tractors in Australia starting to go around farms without a driver, and if the information about the farm doesn't line up with the co-ordinates coming out of the navigation system there will be problems." The Geocentric Datum of Australia, the country's local co-ordinate system, was last updated in 1994. Since then, Australia has moved about 1.5 metres north. So on 1 January 2017, the country's local co-ordinates will also be shifted further north - by 1.8m. The over-correction means Australia's local co-ordinates and the Earth's global co-ordinates will align in 2020. At that point a new system, which can take changes over time into account, will be implemented. "We used the old plate fixed system to make life simple, but we don't want to do this adjustment every so often," said Mr Jaksa. "Once we have a system that can deal with changes over time, then everybody in the world could be on that same system." This is the classic Neal Adams to give perspective. Notice how much Australia moves compared to the other continents. Neal Adams - Science: 01 - Conspiracy: Earth is Growing! We live in a double star system. We need to study double star systems. Clif High is fun. I always wonder if he reads the Forum, because a bunch of the stuff he talks about has been covered in these threads. Everybody wave, just in case. HA! crust mobility conundrum. how does the earth move? Until comparatively recently, the only crustal movements worth the name were thought to be either post glacial rebound, where surface ice melting induces crust rebound until a new equilibrium is established, or gravitational collapse such as weathering and erosion. Both are gradual, isostatic processes. The many extensional features such as rifts, horst/graben faulting, uplift, tilted blocks and basin formation were seen to be part of these isostatic processes, occurring over geologic time scales and with any lateral movement being a localized event. However mounting geographical, geological, paleontological and botanical evidence was pointing to continental mobility on a global scale, and by the sixties the Isostatic Tectonics view was finally rejected in favour of a globally mobile surface with most opting for a surface plate model driven by mantle convection currents, ...Plate Tectonics. Others concluded that the abundant extensional features, the spreading ridge that surrounds Antarctica being one of many such examples, ... such features could only be accounted for by an increase in the surface area, and thus radial expansion, of the earth, ...Expansion Tectonics. 'Surface' mobilists espoused Plate Tectonics while the 'surface area' mobilists advocated Expansion Tectonics. The 'facts' could be made to fit both explanations. But the absence of a plausible expansion mechanism was an insurmountable problem for Expansion Tectonics, and Plate Tectonics was adopted to replace the Isostatic model. To recap, Plate Tectonics prevailed over Expansion Tectonics because Plate Tectonics requires less energy, no mass/volume variation, and, more importantly, it has a plausible mechanism to drive the process, i.e. convection. Earth expansion was a contender process in the sixties but is now considered a discredited theory. It has been considered, and, largely due to the absence of any causal mechanism, rejected by most, but not all , right-thinking geo-folk. This is despite the fact that much of the geological/geographical/botanical/fossil/seismic evidence for plate tectonics can be used to support the expansion model. The evidence is also consistent with a sub-crustal increase in mantle or core/mantle volume so that the increased surface area consists of primordial crust separated by recent ocean crust. Both Plate and Expansion theories assume that the process occurs continuously over geological time spans. Whatever its driving mechanism, tectonic movement is considered to slow but inexorable process. - Physics of the Earth’s Interior. Barbara Romanowicz. From the maps it is evident that Mid-Ocean Ridge spreading centers do not persist below 600 kms. What emerges at deeper levels are ocean sized blobs located under the southerly region of the Pacific and African plates to create a more or less balanced global distribution of these low density/high temperature features. This configuration does not support the simple convection model of a continuous column of ascending or descending material originating near the core-mantle boundary and extending to the base of the, ...according to the Plate Tectonic model, very mobile and actively subducting crust. Convection is an important part of the Plate Tectonics narrative in that it is the proposed mechanism that supplies the enormous amount of energy needed maintain the currents necessary to drive the plates across the surface of the earth. Without it, Plate Tectonics has difficulties with its energy budget as it assumes that surface plate mobility is powered by energy from below. Without convection, plate mobility is left without a plausible driving mechanism. It could not be initiated, let alone maintained. Something else would be required to explain the obvious separation of pieces of continental crust that both Plate Tectonics (and Expansion Tectonics) seek to explain. The lack of evidence for simple convection in the tomographic data has prompted modifications to the model by way of the introduction of a stratified two-stage convection model. This is roughly analogous to a pot filled with water and oil, with separate convection cells in both oil and water layers and a conductive energy transfer process at the interface.of the liquid layers. The modifying effects of uncontained convection are also being considered. The tomographic picture may offer more support to a model where the plates are relatively static with any relative movement due an increase in the overall surface area of the globe together with accompanying isostatic adjustment and curvature modification. Separation by surface area expansion still doesn't have a causative mechanism, but the lack of evidence for simple convection also casts doubt on the viability of the surface plate mobility claimed by Plate Tectonics. The following abstract suggests that some minimal expansion activity can still be discerned today insofar as some of the observed satellite altitude variation that is usually explained as sea level rise is actually the result of earth expansion. According to the space-geodetic data ... vertical variation of the Earth's solid surface suggests that the Earth's solid part is expanding at a rate of 0.24 ± 0.05 mm/a in recent two decades. In another aspect, the satellite altimetry ... demonstrate the sea level rise (SLR) rate 3.2 ± 0.4 mm/a, of which 1.8 ± 0.5 mm/a is contributed by the ice melting over land. This study shows that the oceanic thermal expansion is 1.0 ± 0.1 mm/a due to the temperature increase in recent half century, which coincides with the estimate provided by previous authors. The SLR observation by altimetry is not balanced by the ice melting and thermal expansion, ..., in this study we infer that the oceanic part of the Earth is expanding at a rate about 0.4 mm/a. Combining the expansion rates of land part and oceanic part, we conclude that the Earth is expanding at a rate of 0.35 ± 0.47 mm/a in recent two decades. If the Earth expands at this rate, then the altimetry-observed SLR can be well explained. * By way of explanation, my current view is that most of the expansion occurred in the past when mantle conditions were radically different to present day norms, ...and that the activity was both rapid and episodic.